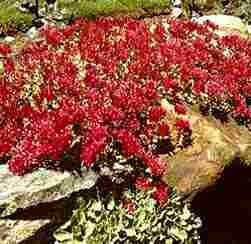 Sedum 'Dragons Blood' is a fast-growing ground cover with brilliant red flowers in late summer. Sedum is a succulent with needle-like leaves turn vibrant orange-red in fall. The more sun Sedum 'Dragons Blood Red' gets, the more intense both the flowers and foliage become. Sedum 'Dragons Blood Red' forms a dense mat 3 - 5" tall and spreads quickly within contained regions. You don't have to worry about it spreading to unwanted areas outside of where you plant sedum.